Drinking in India—what’s your poison? And news of a miracle cure! | Where to next? 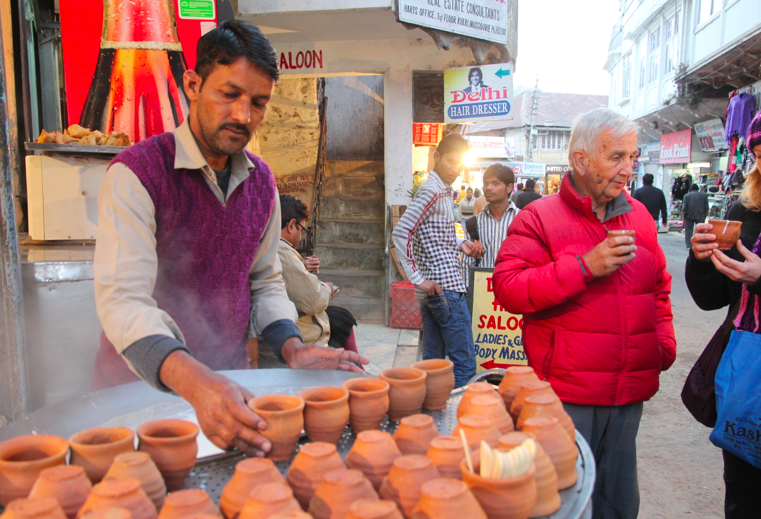 Drinking in India—what’s your poison? And news of a miracle cure! Poor John and Renae (just out of the pic on the right) sample the flavoured milk. I’d have preferred a Christmas-y egg nog. 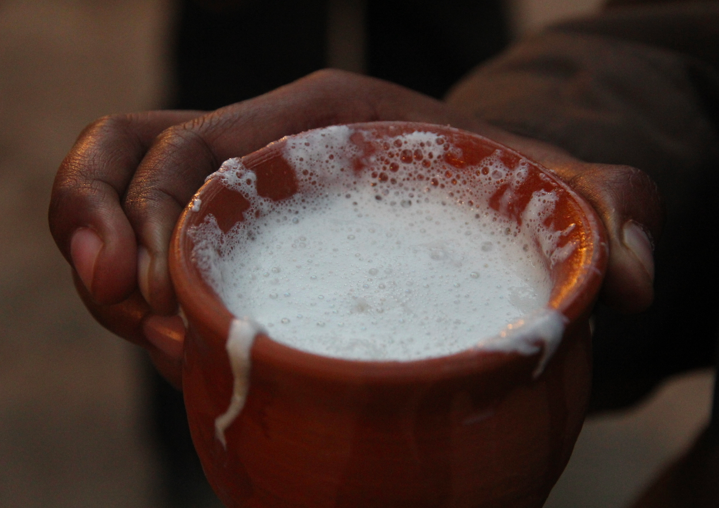 As the festive season heats up, I reckon it’s time to introduce some of India’s drinks. For starters, holiday cheer is often hard to find in India. While there are a few licensed English Wine Shops in most towns, very little wine is actually sold. The shops are usually tucked in out-of-the-way places and, when you front up as a customer, you’ll feel like you’re visiting a prison inmate. The hours are strictly limited and you conduct your business through a securely fenced opening. Peer through the grill, make your choice, push your money through an opening and receive your contraband. Renae and I felt like a couple of floozies the night we went to buy a bottle of Scotch whiskey in the hill station of Mussoorie. We fronted up to the cage and waited for one of the three staff to serve us. Ahem, cough, cough. Nope, we were shrouded in invisibility cloaks. Ahem, ahem, cough, cough, cough. Finally there was a glimmer of acknowledgment and we asked for a bottle of McDowell’s. 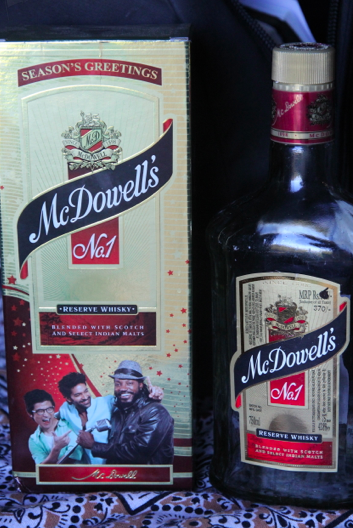 We’d bought a bottle of McDowell’s several weeks earlier for 380 rupees (less than $7) and five of us polished that off over several nights. In the interim, we tried another local brand, which cost more than $15. Outrageous! Given that we found no difference in taste (and to be honest the taste was weak and bland for both), Renae and I figured the el cheapo option would be fine. We were presented with a crushed but intact box holding, what we hoped was, an intact bottle of McDowell’s. Pleased to report it was fine. Beer is another matter. Depending on how ‘dry’ an Indian state is, the price of a 750ml bottle of the country’s Kingfisher Premium beer can range anywhere from 70 to 250 rupees (or from less than $1.50 to almost $5). Of course, both prices would be considered cheap in most English-speaking countries, but the pricey versions are still very dear for the developing world. The unavailability of booze links directly to the problems that the demon drink has caused in the country over the years. Men (and yes, it is mostly men) get pissed (Aussie slang for drunk) and fall over in the road and get killed. Or they spend all their wages on drink and the family starves. Poor John’s story of who can drink and drive has always amused and scared me. When we first visited India in the 1980s, the rules were that a certified alcoholic could buy booze, but a certified alcoholic could not get a driver’s license. The alcoholic needed a doctor’s certificate to confirm the addiction. Trouble was that a boozy husband got his wife to be certified as the alcoholic and then he got the driver’s license. Bad combination. We weren’t bound by these rules—I don’t think anyone is anymore. 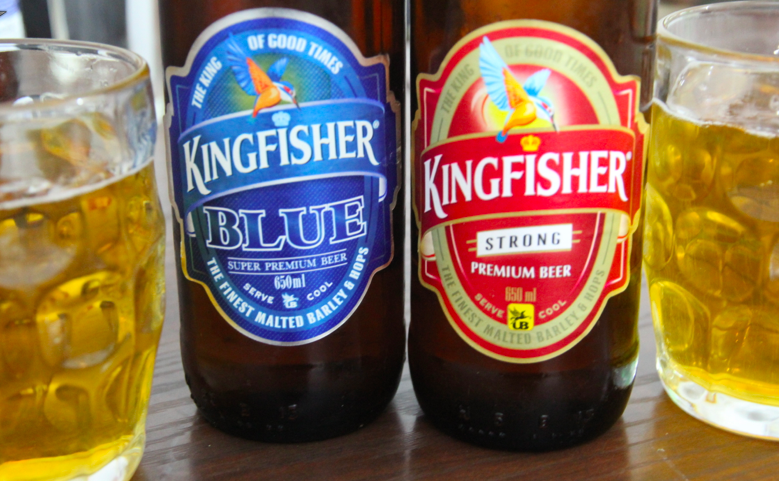 So we enjoyed a few different beers in India—Kingfisher, Godfather and Haywards. I think Haywards had a funny aftertaste, but the others disagreed, so it was just me. 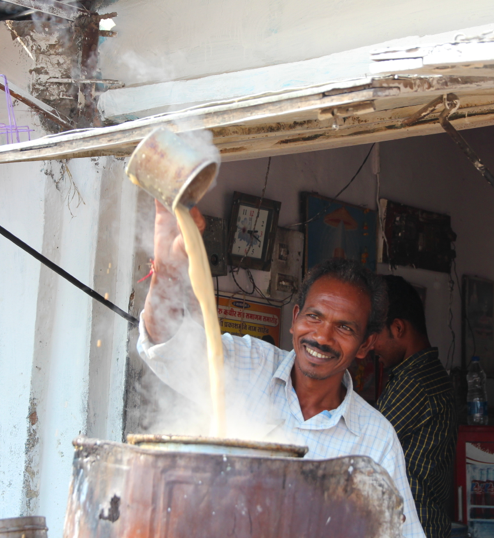 But the favourite drink of India has to be chai—a milky, sugary and very tasty version of tea. It’s made everywhere, all day and in enormous quantities. The biggest batch I saw being made was in a village near Kanha National Park. Overall, I had way too many cups of chai. Normally I drink coffee, but early on in our trip I ordered a coffee that was so weak and so bad, that I couldn’t drink it. On reflection, it might have been made from chicory. Next time I ordered chai and that order seemed to hang with me forever-after. Can’t remember exactly when I broke the spell, but I managed to bring coffee back to the surface before the trip ended. We encountered a flavoured-milk stall in Mussoorie, a hill station we visited for a couple of days after the Prayaan India Overland tour ended. I love milk and was impressed by how the fellow tipped milk from jug to jug, but decided I didn’t need to try any. I have lingering memories of Burmese cows having tuberculosis when we lived there in the 1980s, so I still, probably wrongly, worry about milk in the developing world. 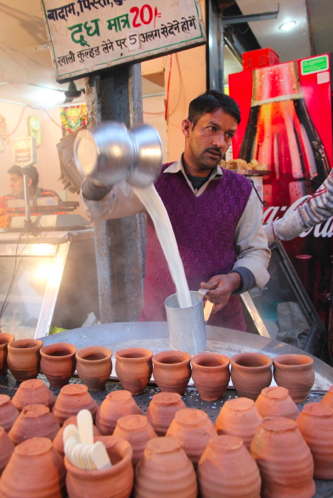 That means I’m not keen on lassi either, which is such a common and popular drink in India. But before I finish, I have to mention the water. Almost everywhere we went in India, we were told it was okay to drink the water. The exception was Bharatpur, where the water was okay to drink, but tasted terrible. The hostel in Bharatpur served filtered water in abundance. In the end, we drank the water everywhere we went, except in Bharatpur. We did brush our teeth with it there, so I suspect that taste is the only problem. All that said, I did get Delhi Belly for a couple of days. I was quite surprised because, over the years, my stomach has seen almost anything that nature can throw at it. The last time I had a seriously dodgy gut was in 1976 in Egypt. And that’s a pretty good claim after visiting about 90 countries. But India gave me a seriously dodgy gut for a couple of days after our tour ended. I have no idea what sparked it. All of us on the tour ate the same food, in the same places. I guessing I got a poorly washed plate. Or who knows what? My cure was water from the Ganges. 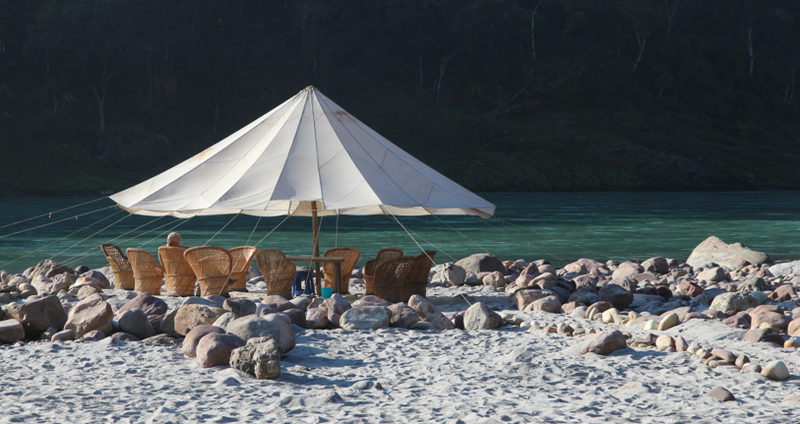 About a week before getting to Delhi, we camped beside the Ganges River. I’ve already written about Brij, the amazing cook at the Three Blind Mice resort, but I haven’t said that we all saved some bottles of the amazing Ganges water from our stay there. The resort was well north of the plains and where the Ganges rushes down from the Himalayas. Soon after I hit New Delhi with Delhi Belly, Poor John said, Why don’t you try the Ganges water we brought back with us? So I did. Completely cured by the next morning. Who could have predicted that? P.S. I have lots more to say about drinks and food in India, so stay tuned. Coming soon a post about a friend’s book on cocktails (Penquin Books asked him to write it), and check out an amazingly divine grapefruit-y kind of drink from a fruit stall seller, who wouldn’t reveal the recipe. Trust me, I wouldn’t be drinking Ganges water in the plains, but up north where we were, the water was crystal clear and fast flowing. The hot chai is delicious, although a bit too sweet for my liking. And India has put a lot of effort into making sure the people have clean drinking water. Even the Ganges water we drank had been treated. Interesting to hear about the partitions in NYC. Makes sense. I don’t understand the reference to the partitions so you’ll have to explain it to me when we catch up. However, I wouldn’t have been sad about missing out on the beer and I too am a convert to chai. When I went to Port Douglas earlier this year I came upon a woman who blends her own and sells it at the markets and also online. I’ll give you the details because it’s as delicious as anything. And I’m so pleased for you that the Ganges cured you. The partitions are just barriers—to protect the salespeople from the customers (possible thieves). There’s also an excellent chai maker at the Saturday market at Epic in north Canberra.